12 inch AromaMagic Wands. These can be used with our AromaMagic Oils, or our Reed Diffuser Base and your choice of fragrance oils. There are many things you could add to your diffuser bottles or vases to make them more unique too... such as sea shells, glass marbles or pieces of colored sea glass, glass or ceramic or wooden beads, river rocks, etc. 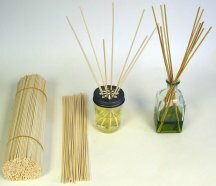 Reed Diffuser Sticks look great packaged in our clear plastic votive tubes. *Wands are bundled by weight, so piece count may vary slightly from bundle to bundle. Counts are approximate. *Jars in photograph are for display purposes only and are not included with the wands.